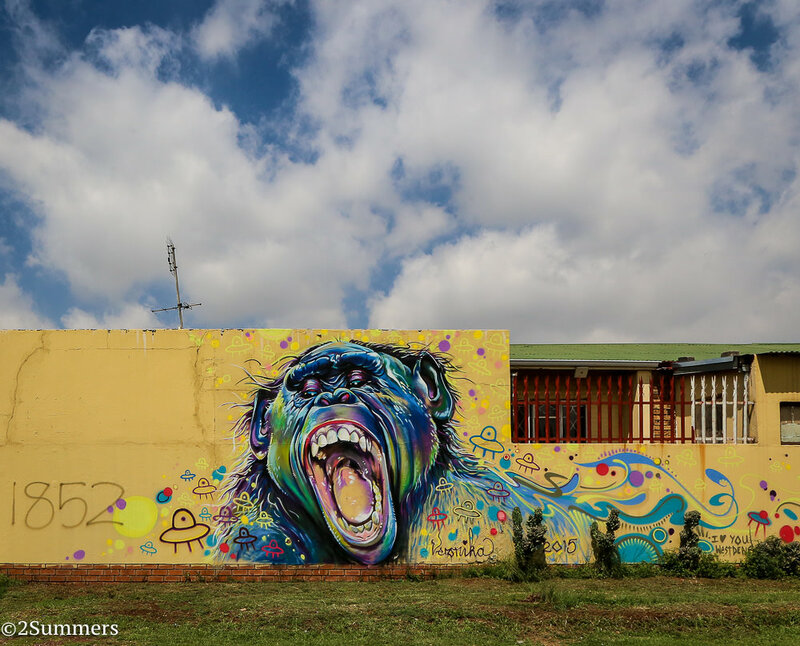 Several months ago a bunch of residents in Westdene, a quirky Joburg suburb just west of my own quirky suburb of Melville, decided to beautify their neighborhood with graffiti. 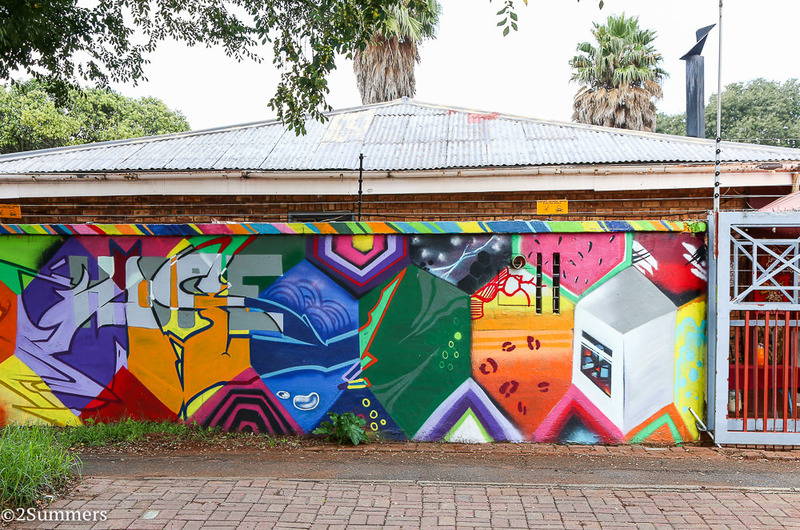 With help from some passionate graffiti champions, Westdene homeowners who were keen to have their exterior walls decorated were paired with graffiti artists keen to decorate said walls. 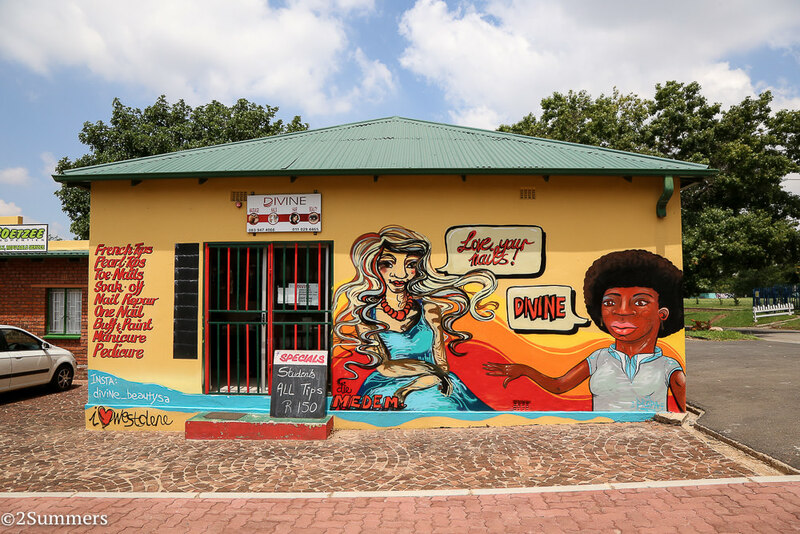 Hence, the Westdene Graffiti Project was born. There are several things I like about this project. 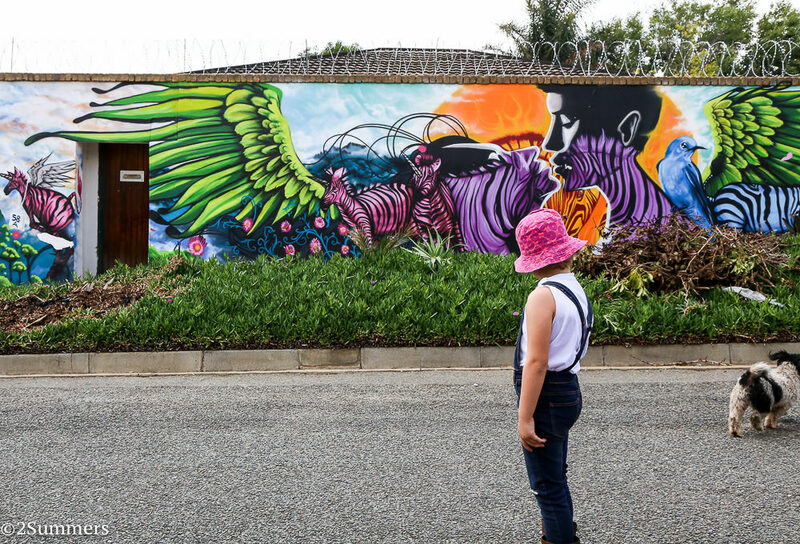 First, it works perfectly in Johannesburg, a city in which at least 70% of residential homes are surrounded by walls. 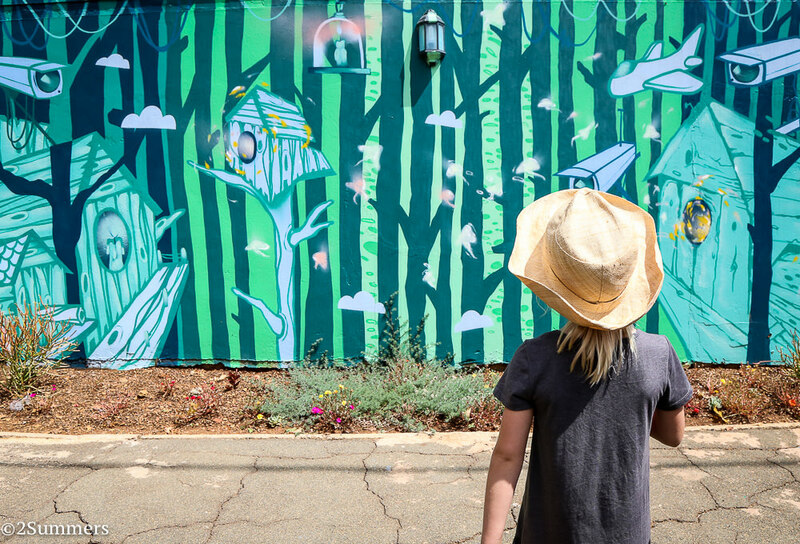 Second, the project is a win-win for both the residents and the artists: residents get beautiful works of art to decorate the outside of their homes, and artists get free walls to paint with full creative license (within reason, of course). Third, my boyfriend Ray is a graffiti artist and he’s painted a couple of walls for the project. Saturday morning there was a graffiti walking tour in Westdene, organized by Past Experiences. I went along because I love graffiti and also because Ray — whose graffiti name is Bias — was the tour guide. Ray is a really good tour guide, if I do say so myself. 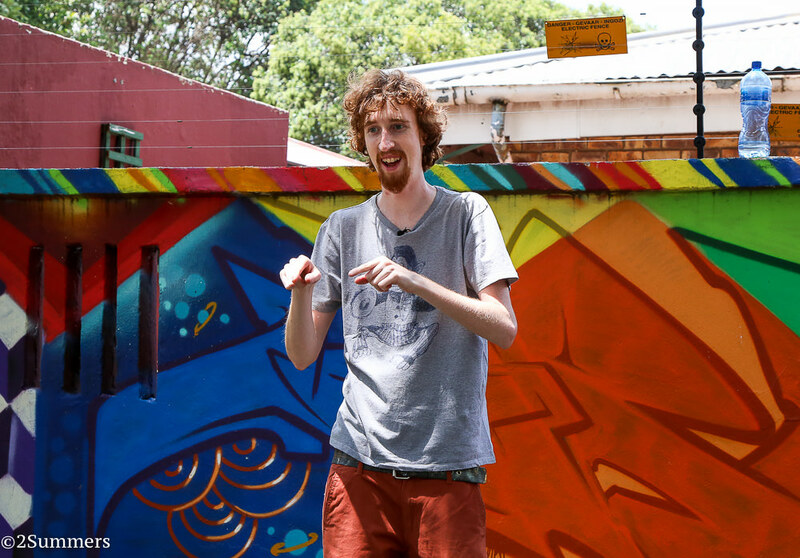 Here he is addressing the crowd in front of one of his own graffiti pieces in Westdene. The tour lasted about three hours and we saw at least a dozen graffiti pieces, some of which were part of the Westdene Graffiti Project and some not. We also visited with homeowners involved in the project and participated in some other fun activities. 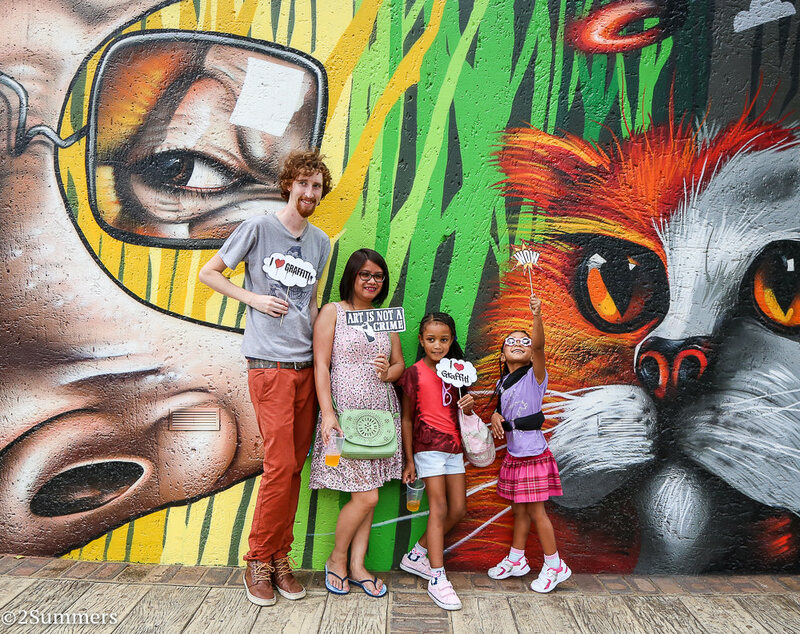 Over the course of the tour, Ray gave a brief explanation on the origins of graffiti, how and why he became a graffiti artist, and the difference between graffiti tags, throw-ups, and masterpieces (or “pieces” for short). He explained some of the techniques that graffiti artists use and demonstrated how to read graffiti lettering. But mainly he just showed us around the suburb and let us admire the pieces for ourselves. 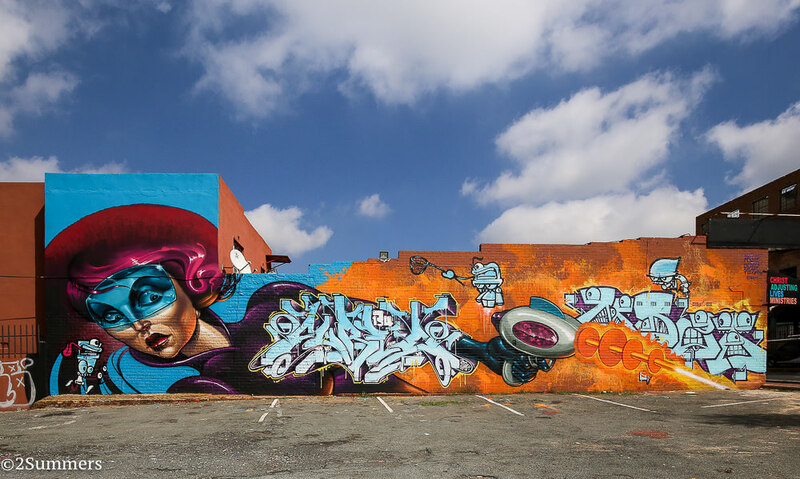 A massive piece by Rasty, Myza, and Curio at the corner of Thornton Road and 5th Avenue, where the tour started. 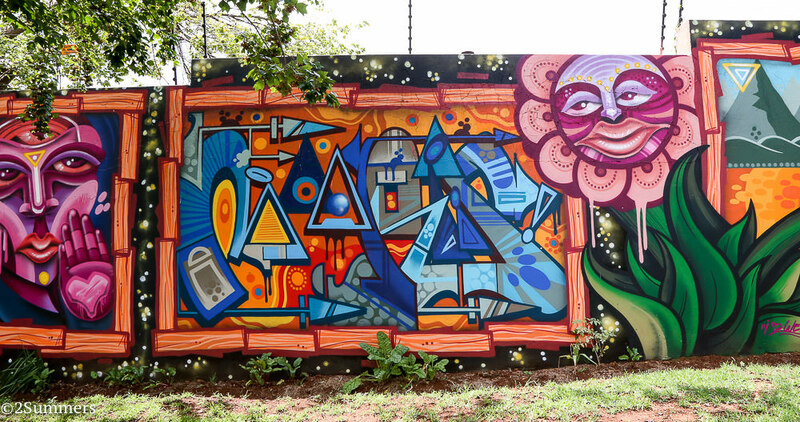 The first Westdene Graffiti Project piece that we saw, painted by Dekor and Tower. The little girl’s name is Erin. One of my favorite Westdene Graffiti Project pieces, by an artist called Veronika. 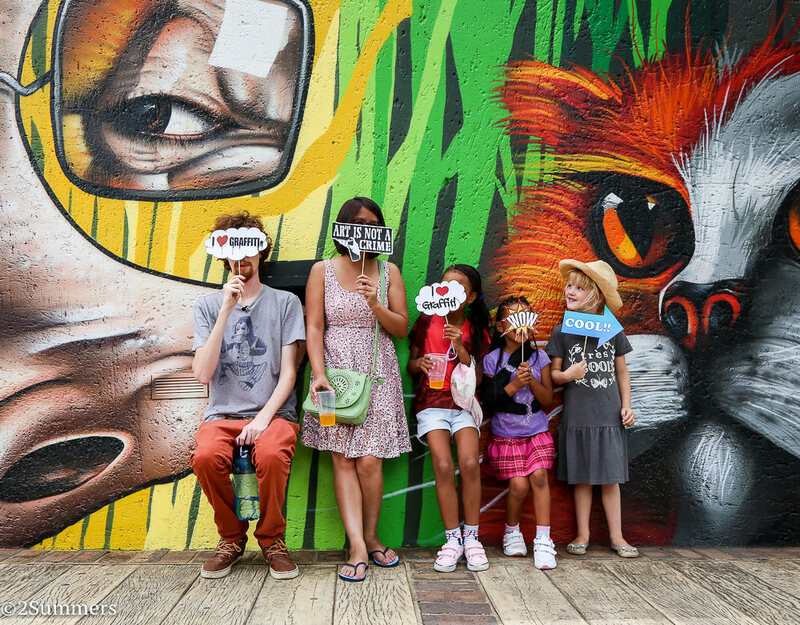 There was a great group of cute kids on this tour. Here’s one of them, Ari, along with an enthusiastic neighborhood dog. The piece is by an artist called Prefix66. A garden-themed piece by Mars. When we reached this piece by Dekor, Kathleen and Clint (the owners of the house) had set up a refreshment station with drinks and these awesome photo props. From left to right: Ray, lady I don’t know (sorry, lady! ), Alice, and Grace. I love this piece, painted for the Divine Beauty Salon, by Miss Propa and Tania. 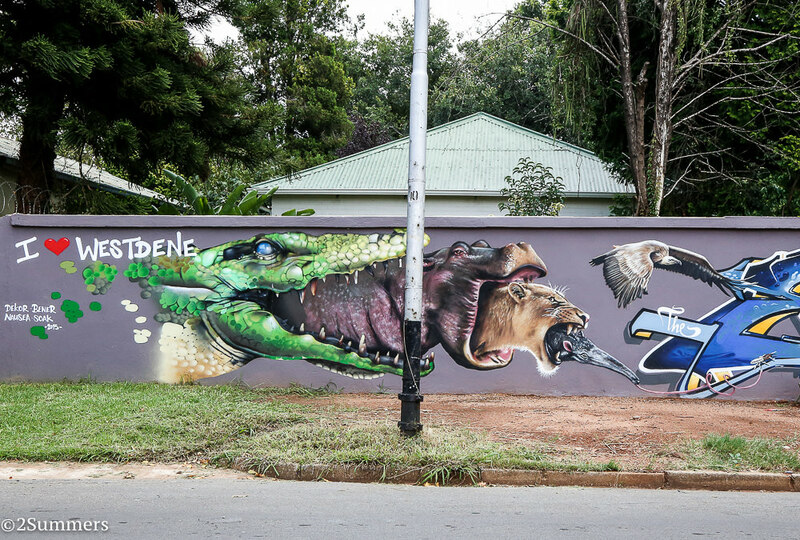 Photos of this spectacular piece — by Dekor, Bener, Nausea, and Soak, depicting a crocodile eating a hippo eating a lion eating an anteater eating an ant — simply don’t do it justice. This is only about half of the wall. Ray’s piece. Again, this is only half the piece and my photo doesn’t do it justice. Ray combined a colorful geometric pattern with his name in graffiti script, overlaid with the word “HOPE”. 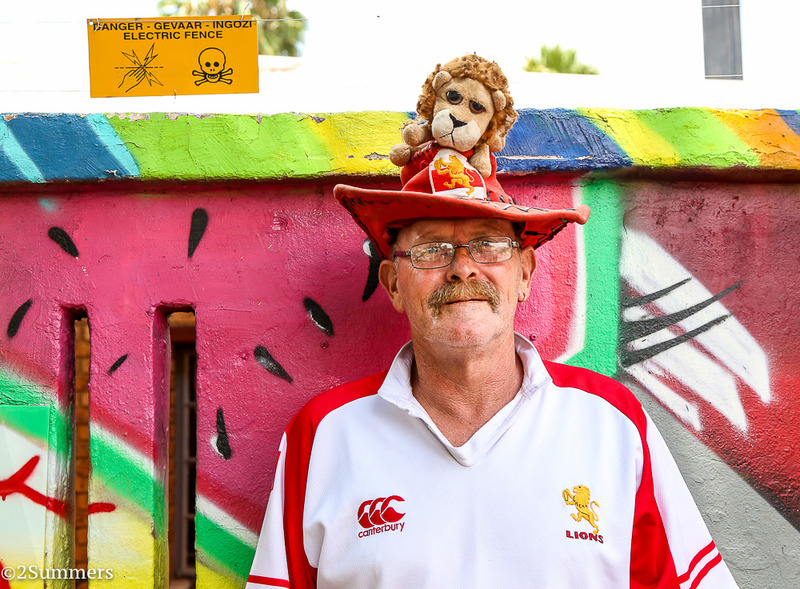 Michael, who owns the house, is a huge Lions’ rugby fans. The red and black design to Michael’s left depicts part of the Lions’ flag. 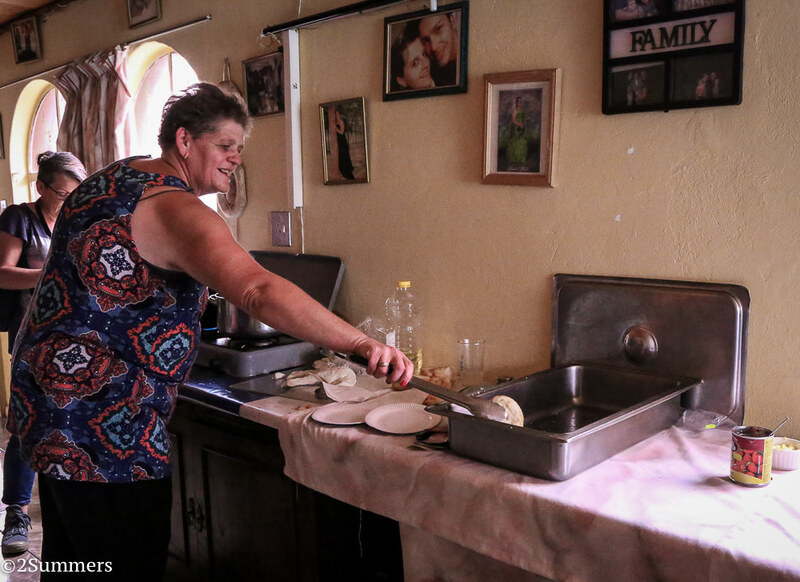 Michael’s wife Rachel sells vetkoek — traditional South African fried dough — for a living. She prepared fresh vetkoeks for us when when we arrived at the house. 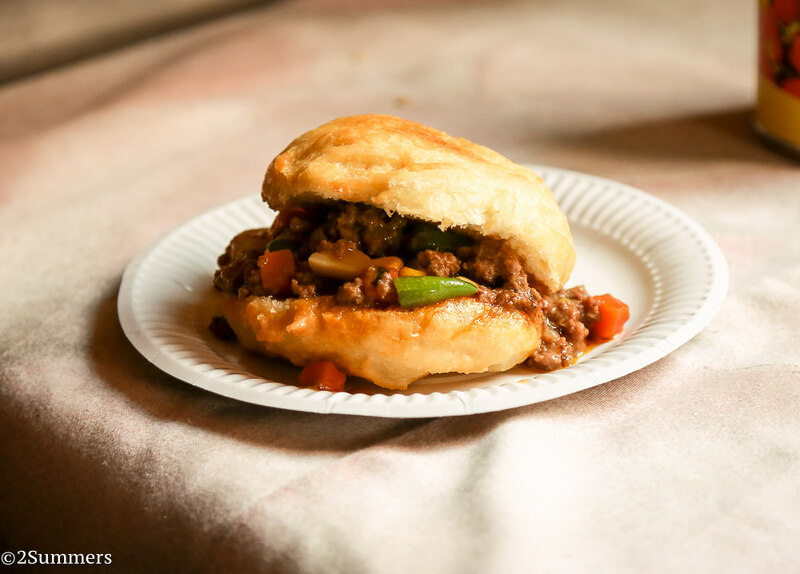 A vetkoek sandwich with mince meat. It tasted like a sloppy joe but 100 times better. And those were the highlights of the tour. I don’t think my post sufficiently communicates how much fun I had. I loved it, and from the looks of all the people crowding around Ray at the end of the tour and asking for pictures with him, I think everyone else did too. But don’t just take it from me, as I’m obviously biased. 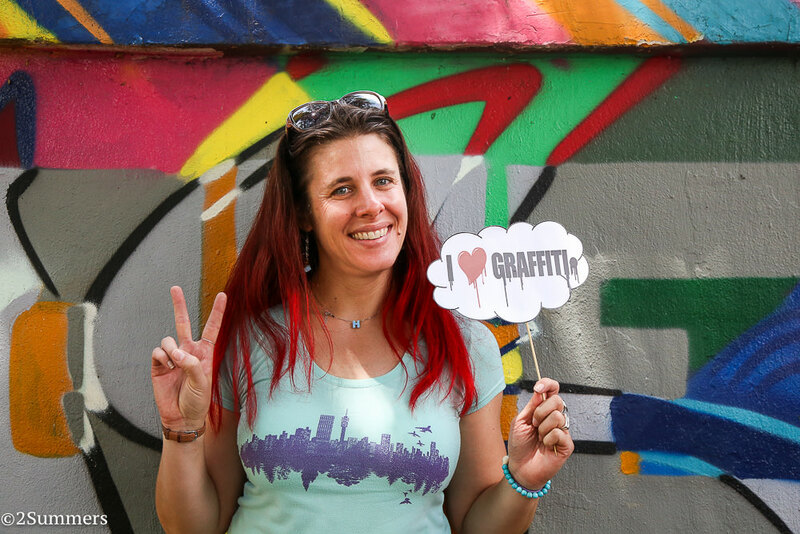 I’m sure there will be more Westdene graffiti tours in the future, and Past Experiences has other recurring graffiti tours in several neighborhoods around the city. Keep an eye out on the Past Experiences Facebook page. Oh, that is just so inspiring! Love, love love the pieces. Do the residents get to pick a theme or an artist? Yeah, I think it’s kind of a case by case thing, but Ray usually meets with the homeowners beforehand and talks with them about what they like. Then he does his own interpretation of whatever they talk about. I live near Westdene in Montgomery Park and would love to go on one of these tours. A friend of mine went on a graffiti tour around London and some of the art is just amazing! Awesome! Keep an eye out for the next tour. These are all amazing, I need to do this tour sometime ! I mean please. Haha. Autocorrect. Dear Heather, I just wanted to say thank you for not only this posting but for your blog as a whole. I just visited Johannesburg for only a week, a local gave me the link to your blog beforehand so I had an idea what to expect. Your pictures are amazing, the texts insightful and funny. It was in part because of your blog that I had such a great time in Melville. Hi Constanze, thanks so very much for this message! It’s like music to my eyes (haha). I’m so glad to hear that you enjoyed your time in Joburg and that my blog played a role in that.